Each body tells a story. This is the tale of a woman’s decision to switch over from her residency as a surgeon to training as a medical examiner. You know CSI, Criminal Minds, the other CSI, Rizzoli and Isles, the other other CSI, etc.? Forget them. They fit almost as well into the fantasy genre as Game of Thrones or anything with werewolves or vampires. I grew up watching Quincy, M.E. I’m as fond of Jack Klugman from that show as I am of Oscar Madison. But I think it was mostly his fault that I was as shocked as I was – which was extremely – when I grew up a little and found out that doctors can’t always diagnose illness or determine cause of death with certainty. Quincy and shows like it always made it seem like it was very basic puzzle–solving, like simple algebra: this symptom + another symptom – some other symptom = diagnosis; some were just more obscure than others, or perhaps there might be obscuring circumstances. Hey, I was young; I didn’t quite have a handle on how vastly simplified the world is on the other side of the tv screen. It must be nice to live there, where the killer is always caught (in 48 minutes! Unless of course it’s a featured serial killer who escapes and will be returning for the season finale) and the disease is always cured, or at least identified. Honestly, I remember being very confused and gobsmacked the first time I saw something that was, you know, real. On CSI, there is impatient sighing when they have to wait a few hours for DNA results. In reality, it’s more like months. Whatever it was, it wasn’t as real as this book. Turns out a tox screen can take a couple of weeks – and that shocked me. Need a copy of a report from another department? Give it a few months. 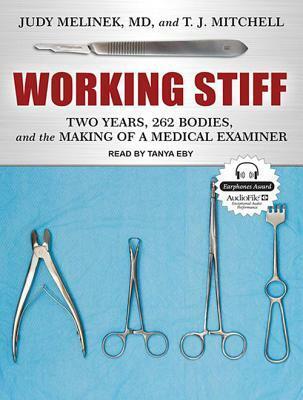 It’s been a little while since I bought this audiobook, so I don’t remember whether the setting in time of the book had an impact on my decision to give it a try: Dr. Melinek changed her concentration from treating the living to examining the dead in 2001. She trained in New York City. If the idea that she was involved in the aftermath of 9/11 was one of the reasons I opted for the book, it was a moment of temporary insanity. To this day I flinch when a plane flies low. I live in Connecticut. I’ve visited NYC many times – and police and fire fighters from my area went to Ground Zero. I had friends and friends–of–friends who live and work in the City. I heard first–hand accounts, that weekend. It’s emotional. Still. Of course. Between that and the basic subject matter, this book is not for the squeamish. But it’s a story well told, with humor and compassion – and passion. Even while I was cringing, I enjoyed it. This entry was posted in books, non-fiction and tagged audiobook, Judy Melinek, Tanya Eby, Working Stiff. Bookmark the permalink.